The Hannah Dining Set is a basic 3-pc drop leaf table with two ladder back chairs which are perfect for any kitchen. Close the drop leaf for easy storage. Overall fully opened table size is 42" in diameter x 29.50" High. Each drop leaf size is 42"W x 17"D and includes 2 chairs, 16.60"W x 20.50"D x 34.70"H. Seat dimension is 16.5"W x 15.5"D with 18" seat height. 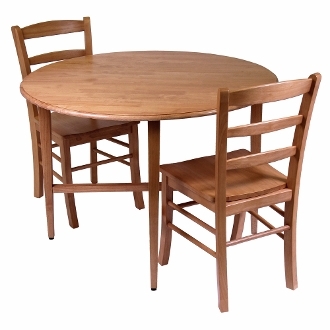 Table folded is 41.90"W x 9.7"D x 29.30"H. Made with solid wood in light oak finish. Assembly needed. Includes 2 chairs, 16.60"W x 20.50"D x 34.70"H. Seat dim is 16.5"W x 15.5"D with 18" seat height. Table Folded 41.90"W x 9.7"D x 29.30"H. Made with solid wood in light oak finish. Assembly needed.